My company offers professional and accurate bookkeeping services helping business owners to be more informed about their accounting and make better financial decisions. Because of my extensive experience in bookkeeping, my clients benefit by getting a personalized, quality service that is beyond comparison. Below I have listed the different services that I offer to my clients along with a brief description. As the list below is by no means all-inclusive, please feel free to inquire about other professional bookkeeping services if you do not see it listed. If it is not a service I provide, I would be more than happy to refer you to a qualified professional that can help you with your bookkeeping needs. I can assist you with the day-to-day tasks associated with your bookkeeping write-up services including entering income and expense transactions, accounts payable, accounts receivable and adjusting entries to tie out to year end reports for tax purposes. Including mobile and virtual bookkeeping service. 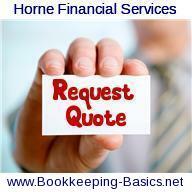 Click here to Request Bookkeeping Quote now! Bank reconciliation is a necessary monthly bookkeeping services task. One of the reasons it is important is so that you are able to stay on top of your cash flow and not end up in the red. Or in other words, overdrawn on your bank account and incurring unnecessary non sufficient fund fees. I can assist you in the preparation of your financial statements such as the profit and loss statement in accordance with professional standards. The financial statements produced can be a useful tool in management for making beneficial financial decisions. The profit and loss statement is essential for financial forecasting and projection which is a necessity when trying to effectively manage and lead a business to profitability. The Balance Sheet helps you to see the big picture of your business. It gives you an indication of whether your business is improving or going down hill. From simple bookkeeping projections to more complex financial modeling, I can assist you in achieving your company's financial goals by providing clean financial statements. Accounts Payable is used to record the bills and current liabilities of a business that are outstanding and is also referred to as A/P for short. A business can be profitable and still run into trouble due to cash flow issues. By properly maintaining your accounts payable, I can track cash-flow and help make sure you don't fall behind on expenses. Accounts Receivable refers to the outstanding money that is owed to you for sales that you have already made that haven't been paid for yet. I view my role in the financial reporting process as an opportunity to provide constructive solutions for maximizing your company's profitability and efficiency. Staying on top of A/R is one of the ways I can do this. Maintaining the chart of accounts is a must for your business. Often times when a business first gets started, organization of accounts, accounting records and transactions ends up being a low priority. This is in turn ends up making for quite a mess at tax time and leads to unnecessary stress for you the business owner. I can help you with the clean-up and organization of your current COA and bookkeeping system. There are many great online income taxes software programs available. I previously used Taxwise in my business, and have since graduated to the more advanced Lacerte software. These are both form driven accounting service tax preparation programs. They are great for a tax preparer to use, but not for the everyday person. If you like to prepare your own taxes and do your taxes online, you will find the best name brand income tax preparation software here, all at discounted prices. Follow this link to file your Online Income Taxes now!